Traditional Chinese Medicine has been around for thousands of years, and has been helping women conceive and beat the infertility odds since then. In Vitro Fertilization (IVF) is a much more recent procedure and has been generating enormous amounts of success by helping women who cannot reproduce naturally. We believe that combining the ancient art of acupuncture with the modern scientific method of IVF is the best way to guarantee the best possible results for you. If you are eagerly waiting to start your own little family, but your body refuses to cooperate, we urge you to try acupuncture for IVF support to ensure a much higher chance of conception. Acupuncture is an ancient Chinese art of holistic healing and it works by inserting tiny, painless needles into the surface of your skin, in certain designated spots, or acu-points. Stimulating these areas improves circulation and helps maintain steady blood flow to the desired area of your body, in this case the ovaries and uterus. By also helping your body release the right hormones, balance is restored to your menstrual cycle and many issues will start to resolve themselves in a safe and healthy manner. The theory behind this is that energy, called qi, flows through your body and ensures that everything functions the way it should. When the balance is upset, it is usually because there is a blockage and the qi is not flowing smoothly. Qi is physically manifested as blood, and whatever the problem is, it can be made better by focusing blood circulation in specific affected zones of your body. In Vitro Fertilization is carried out when conception cannot naturally happen in vivo, meaning inside of an organism. A woman’s ovulation pattern is monitored and stimulated, after which the ova is removed from the ovaries and placed in a fluid along with the man’s sperm. The fluid is kept under laboratory conditions and monitored vigilantly, ensuring that the environment allows for fertilization in a way that the woman’s body cannot. Once the cell is fertilized, it is cultured in a test-tube for a few days, allowing for growth, and then it is transferred into the woman’s uterus. If the embryo implants, it is considered a successful procedure, resulting in a successful pregnancy. How Can These Two Work Together? Acupuncture stimulates blood flow to the ovaries, facilitating follicle growth. It also increases blood flow to the uterus, making it more suitable for housing an embryo. When the IVF procedure is completed, acupuncture can help promote circulation to the uterus, making the uterine lining stronger and more capable of holding the embryo. The uterus and ovaries are better nourished with steady blood flowing to them, and rates of implantation can rise drastically. Continuing the acupuncture therapy can ensure that a miscarriage does not occur, along with reducing stress, anxiety, and other harmful side-effects. At our wellness center in Aventura Florida, we believe in a combination of eastern and western medicine to help you receive the best of both worlds. Acupuncture therapy has no adverse affects for your body, and can help maintain perfect reproductive health. 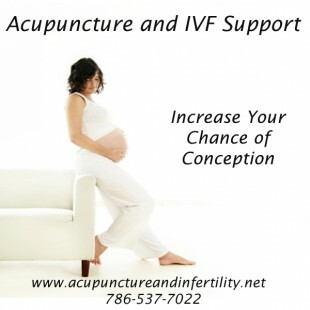 It is best to start acupuncture treatment 6-8 weeks prior to your IVF transfer. To learn more about our specialty, Acupuncture for Infertility and IVF Support, please visit our website dedicated to this topic. To make an appointment, call us at (786) 537-7022 and we can begin your treatment immediately. Our wellness center does accept insurance for acupuncture treatment. Andrea is very professional, knowledgeable, gentle and caring. I am a holistic chiropractor. I was in Florida on vacation. I had a sinus and ear infection and needed to get well enough to fly back home to Arizona. Andrea treated me with acupuncture and an herbal formula. The treatment was very helpful. I was able to take my scheduled flight four days later. Thank you Andrea!! Amazing and so beneficial. I found Andrea through a mutual friend. I was talking to her about my migraines and how they were starting to interfere in my everyday life. She suggested I go and see Andrea. I had never done acupuncture prior to this experience so I was nervous. I hate needles for sure but I needed something to help with my head. I went into the office and Andrea spoke to me about what was going on and then explained exactly what I was going to experience. She was calming and made me feel so relaxed. It has now been a week and my migraines have gone from daily to weekly. I'm hoping with the help of Andrea they will go away all together. If you really feel like there are no other options, this is the place to go. I never thought of acupuncture before but a friend suggested it and now I'm a believer. Caring and informative, Andrea provided much support and help for a debilitating low back and neck condition. After only a few treatments I'm feeling much better. Great experience. I recommend her! Andrea is amazing! I have been coming to her office for almost 3 years!...a very professional and caring person !!!! Highly recommended her!!!! Acupuncture is a gentle and effective way to address many common illnesses and conditions. Acupuncture is painless and most patients find it to be a very relaxing and enjoyable experience. Below is a short video explaining what acupuncture is, how it works, and what to expect from your first treatment. Get the latest news and research studies focused on acupuncture and holistic medicine. Designed by WPZOOM Copyright © 2019 — Andrea Schmutz AP, DOM. All Rights Reserved.